Frank Marshall ( Marzalkiewicz ) lived from March 9,1900 to October 10, 1969. The Mack & Son Woodworking Shop opened at 720 S. Clinton Ave in Chicago , Illinois in 1880. Their main line of business was architectural wood carvings and model making for ornate door frames, room moldings and signs. Two brothers, Theodore and Louis came with their father, Daniel Mack from Plymouth Massachusetts in that year to set up their shop. Later, Theodore's son, Charles joined in part time to supplement his income from his Tavern around the corner on Harrison Street. 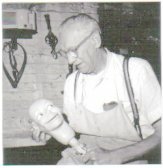 Charles also carved puppets as a side line . Around the turn of the century, the Great Lester (Marian Czajkowski) came to the Macks for help in making a new figure and when word of this got out, the Macks found themselves with many customers looking for ventriloquail figures. Not long after this, a neighbor of the Great Lester's son, who had been stricken with polio, was brought to the Mack's shop by Lester. This 13 year old, Frank Marzalkiewicz, was given a job as a means of rehabilitation. The boy later changed his name to Frank Marshall. As years passed and Frank's apprenticeship was completed, the Macks turned over nearly all the puppet work to Frank, while they concentrated on the ornamental work. Louis Mack passed away on Oct. 12, 1921. He was never much involved with the puppet business. In November of that year another woodcarver , Alex Cameron was hired for the ornamental & pattern shop. Many times Alex and Frank would help each other with their various jobs. In January 1922, Theodore Mack was placed in a Nursing Home due to chronic hepatitis and senility. He died on April 24, 1923. With the two brothers gone, Frank and Alex were left to run the shop, as Charles had to concentrate on his tavern & restaurant. Frank and Alex would handle the puppets & minor carving pieces and Charles would work on the major ornamental pieces. His son, Daniel, would occasionally work at the shop. Charles Mack died on June 4, 1924. Frank And Alex soon after bought the business from Charles' widow Martha. Frank and Alex moved the business to 67 W. Ohio Street and did mostly puppet work. Three years later, Frank took over the shop which was located at 53 W. Erie Street. From around 1931 to 1938 Frank had his shop at 837 N. State Street. From there he moved to a two flat ( apartment ) building at 5518 S. Loomis Street. He resided on the 1st floor and rented out the second floor residence to tenants. His shop was in the basement. From 1950 to 1954 Frank had his workshop in an office building in the heart of the"loop" , the center of the theatrical area , in downtown Chicago. From 1954 until his death, Frank worked from his home at 5518 S. Loomis.